A stylish, well-built roofline helps to secure your roof and enhance the appearance of your home. At DP Windows North Devon Ltd, in Bideford, Devon, our workforce specialises in gutter repairs, as well as other services to do with fascias and soffits. Whether your roofline is damaged or you're having the full thing replaced, look no further than our highly skilled experts. Your property's exterior is the first thing guests and passersby notice, so it's essential that it's well-maintained as it has the potential to set a first impression. 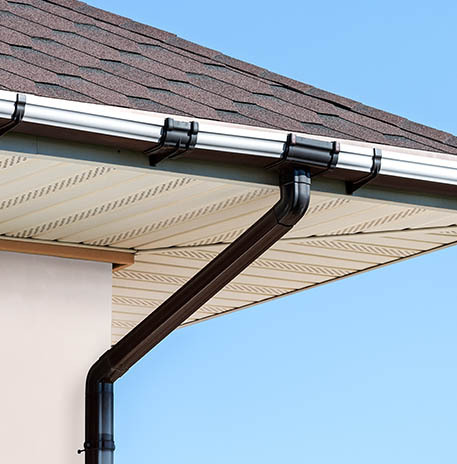 Fascias, soffits, and gutters are important for the roof, and our experts are on hand to make sure that yours are in the best possible condition. Offering products in either white or woodgrain, we'll make sure that what we provide suits your home. When your property requires a touch up, look no further than DP Windows North Devon Ltd. We'll come out and visit your home to establish your requirements. While there, we'll provide you with colour samples and take accurate measurements before providing you with a free quote. We'll then go ahead and book for the work to be carried out, though we do advise this is usually between 6-8 weeks after the contracts are signed. Similar to our window and door services, we offer an insurance-backed guarantee with our rooflines. As we pay great attention to detail on every job, you can rest assured knowing that we'll deliver professional results. Taking pride in our respectable reputation, no job is too big or too small for us. We're also able to carry out roof repairs, from stripping off old roofs to re-felting when required. Contact us today, in Bideford, Devon, for more information about out gutter repairs and services regarding fascias and soffits.